Play me like those Light Novels Baby! You don’t always look through a selection of free-to-play games on your device’s respective store and expect to find a gem in there. Usually it’s either you have crap to mediocre presentation served with a decent gameplay system, or a game that looks really awesome but has little to offer in terms of replay value. That’s why there’s an unwritten law that free-to-play games are mostly just for casual gamers. That’s why when a company like Zynga releases a free and aesthetically pleasing card-based RPG, it’s no wonder that more than a couple of heads will turn. 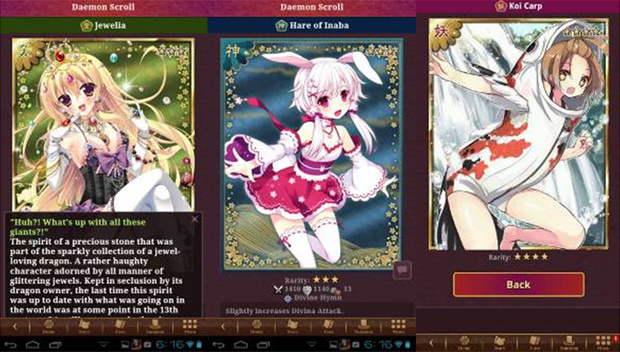 Ayakashi: Ghost Guild is a fantasy-themed mobile card battle RPG by Zynga for both the iOS and Android. You play as a mysterious “ghost agent” who sympathizes with the monsters of the game which are “daemons.” Whereas most other ghost agents would exorcise rogue spirits with no questions asked, your hero tries to reason with them and recruit them, either through bribery, negotiations or by helping them out in ways set within the context of the story. As the game progresses, you’ll eventually have the capacity to summon a daemon of your own. Once recruited, you can assemble a team of daemons to fight off hostile ghosts, rivals and monsters. The MMO part of Ayakashi comes in when you can request the daemons of the friends you’ve added in-game to aid you in battle. 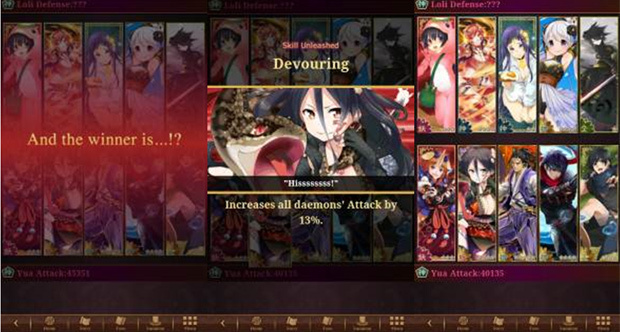 Like most mobile card games, Ayakashi is 60% card collecting, 30% card battling and 10% clicking through a linear plot. It aims to appeal more to otakus than card game enthusiasts. Why you ask? Well, for starters, putting up a game with the labels “free” and “RPG” is already enough of a flag to get people downloading. Decent RPGs these days are rare and when a big company releases one, fans can’t help to at least try it out to relive the glory days of the classic console dungeon grind-and-crawl. The art style having a heavy anime influence doesn’t hurt either. The Story Mode itself (as well as playing through the monthly event scenarios) is like playing through a visual novel, which is a bad thing for casual, non-otaku players or those who aren’t familiar with the visual novel’s system of progression. Most of what goes on is linear and random at the same time and tends to be boring to those who aren’t familiar or into visual novels. All scenarios are done by clicking on the only button available again and again until something happens, which is pretty drab even for a dungeon crawler. Mashing “Investigate” over and over allows you to progress through any event, making you encounter random ghosts to fight or interact with, items to collect or move the story along. So from a linear story progression, you’d expect that battles may be a little interesting, however, you are sadly mistaken. Combat in game is quite a disappointment as well. You do not do anything while it happens at all. You merely watch as you pit your assembled team of daemons against another and hope for the best. This happens for both PvP and PvE – boss or otherwise – type of battles. You don’t even get any generic hit sparks exploding all over the place to create the illusion of each daemon whacking each other. It’s basically just each daemon activating their own skill- which may or may not turns things up a bit– then all of them just clashing together, leaving you hoping for the best as you wait if the minor pluses they all did nets you a win or a loss, but that’s as exciting as the gameplay gets. Since battles are basically just you pitting your team’s combined stats against your enemy, the most you could do to influence your victories is in the assembly of the team itself. 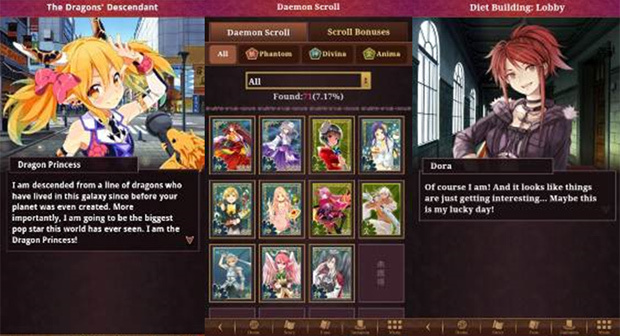 The game allows you to collect different daemons through events or by purchasing them. You can also enhance your demons through fusion – feeding other daemons to the one you want stronger. By levelling them up this way, you get to improve their stats and increase their skill levels. But despite its monotonous and repetitive gameplay, Ayakashi still has a lot of good to offer. It plays heavily around the story of you as a ghost agent, recruiting, helping and negotiating with the various daemons of the world. It’s very reminiscent of the famous Raidou Kuzunoha franchise of the Shin Megami Tensei fame. It has a grand plot to follow, but each and every little character you meet has their own roles and stories to play. And no matter how short or irrelevant those said stories may be, it gives you a lot to take in, adding a lot of depth to the otherwise lacklustre pace of the game. Even the monthly event scenarios have a lot of story content to offer. 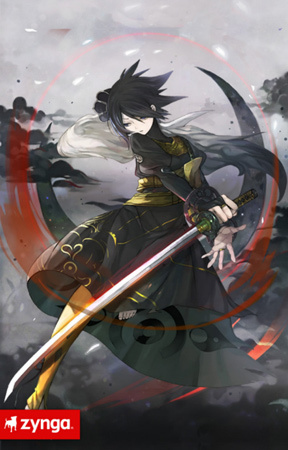 But the real appeal of Ayakashi: Ghost Guild is in its art. The game currently boasts a thousand different cards to collect and each is a unique render. Many cards “evolve” into different forms of themselves. Unlike other mobile card games where variants are merely palette swaps, flipped images or both, evolved cards in Ayakashi are ultimately cards with new art. A lot of artists contributed designs for the cards and each rendition is as masterfully done as the next. Also, as soon as you acquire a card, it’s recorded in a gallery called “Scroll”, which acts as your Pokedex for this game. Here you can view the full art of all the daemons you have recruited so far, as well as their respective lore. I have to admit, it’s very satisfying to see the card gallery slowly complete itself. Ayakashi: Ghost Guild is a game of patience, determination and luck since one mostly plays the game to just collect the cards. In order to succeed in missions, you must be smart in composing your attacking team and defending team in terms of their clan ratios and skills, and not just because they look aesthetically pleasing together (which I am initially guilty of). It’s not a bad game really. True, it suffers from connection issues and repetitive static gameplay, but in essence, it was meant to please a specific demographic – the otakus. In its core, it’s basically a glorified interactive visual novel wherein you collect character cards instead of CG screens. It gives a decent story to follow to complement the high quality of artwork it comes with. It just doesn’t have that much to say as a card game.